Is a ladder the right tool for the job? 2017 Regulatory review submission on falls. The following information will help you determine whether a ladder is the right tool for the job, what you should look for when purchasing or selecting a ladder, and how to safely use and maintain a ladder. This poster is also available from the Union Office or your onsite OH&S Rep.
To view and download the WorkSafe guidance note, "Prevention of Falls in Construction- Selection and Safe Use of Portable Ladders" click here. The guidance note has been developed in response to the recommendations contained in the findings of the Coronal Inquest into the death of Keith Dickman. To get a full appreciation of the importance and relevance of this guidance note, click here to download the findings of the Inquest. THIS FORM MUST BE CONSIDERED PRIOR TO ANY WORKS COMMENCING IN AN AREA. THIS FORM IS TO BE KEPT IN THE AREA WHERE THE WORK TASK IS BEING UNDERTAKEN. This work method statement is to be read in conjunction with associated guidelines, work procedures, hazard identification, risk assessments and Safe Work Method Statements. All associated personnel are to be suitably instructed and trained and comfortable in relation to working at height and will have been trained in this & associated work procedures. All works, tools, equipment and plant are to be used in accordance with industry standards, company policy, codes of compliance, legislation & regulation. Hazard/Risk type: Fall from height – death, serious injury, sprains, strains, fractures, abrasions, contusions, lacerations, open wounds and dislocations. 1. Issues to be considered when working at height. Can the work be performed on the ground? Can the work be performed from a fixed scaffold? Can an Elevated Work Platform [EWP] be used? 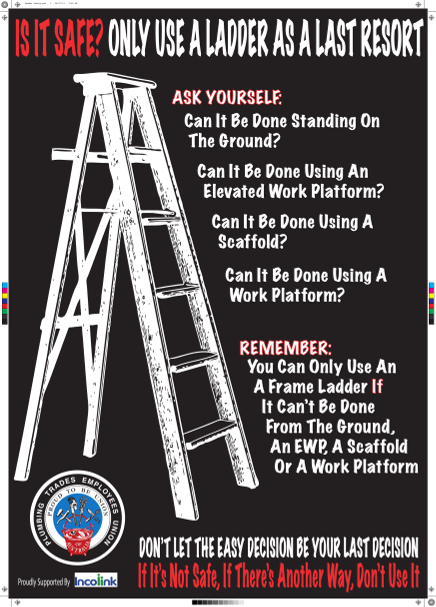 Can a mobile scaffold be used? Can a work platform (chariot) be used? If it is determined that ladders are the most suitable and practicable option available to be used, then only after assessment of the practicability of other methods the following shall apply. Generally ladders should be the last method of controlling work at heights, however regard as to the practicability of controlling work at heights needs to be incorporated into the selected work method. greater than this will need to have additional documented risk assessments and Safe Work Method Statements, developed and implemented. It is also anticipated that ladders may be selected for use when clear floor spaces are unavailable and floor load limits restrict the use of EWP’s, mobile or fixed scaffolds or other means. It is anticipated that ladders may be selected for use when physical space restricts the use of other methods to control the risk of working at heights. It is anticipated that the use of power tools will be restricted to the cordless type. It is anticipated that the tasks where ladders are to be used will be of a light duty nature. Ladders will not be used within 3 metres of an unprotected edge or perimeter of the building. If in doubt about using a ladder ask your elected HSR, the Site Safety coordinator or a member of the Safety Committee for assistance. Work from a ladder using equipment primarily designed to be used with two hands; this includes tasks that do not allow for three points of contact, i.e., both feet on the rung and one hand free for balance and support. Further guidance and definition should be sought from WorkSafe Victoria Guidance Note “Prevention of Falls in Construction, Selection and safe use of portable ladders.” (2013) and the Codes of Compliance for the Prevention of Falls in Housing / General Construction. Remember - If in doubt ask. The OH&S Unit is supported through Incolink funding. The Plumbers' Union is one of the fastest growing and most progressive trade unions in Australia. Our record of protecting workers' rights and entitlements since 1850 is second to none. We have been Federally registered since 1912.